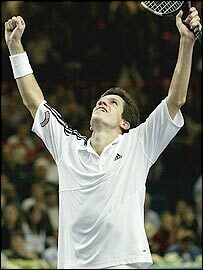 Tim Henman beat Andrei Pavel in straight sets to claim the biggest title of his career at the Paris Masters. Henman came through 6-2 7-6 (8-6) 7-6 (7-2) against the unseeded Romanian. It is the first time the British number one has won a Masters Series event - the most prestigious outside the four Grand Slams. Victory moves Henman up to 15th in the world, reversing his slide down the rankings after injury. Henman came into the final in confident mood after successive wins over Sebastien Grosjean, Gustavo Kuerten, Roger Federer and Andy Roddick. Pavel was a different prospect, having been sidelined for the first half of the season with a back injury and with only three victories all year before heading to Paris. The danger for Henman was that he would fail to repeat the form shown against the world's best players faced with such an unexpected opponent. That notion was dispelled when he broke in the fifth and seventh games to take the first set, and it was the same story in the first game of the second set. But with the match seemingly under control, a nervous Henman almost threw his advantage away. He failed to serve out at 5-4 and then wasted two set points at 6-4 in the tie-break, before breaking again in a tense exchange at the net and converting at the third opportunity. Get in Tiger Tim! What a victory! What a week! Pavel looked marginally the better player in the third set but neither man could make the breakthrough. It came down to another tie-break and Henman again proved the stronger when the pressure was really on, breaking early and holding on for his 11th career title. "Henman's season ends with the most important tournament win of his career"
"It's been an incredible finish that in all honesty I didn't expect"